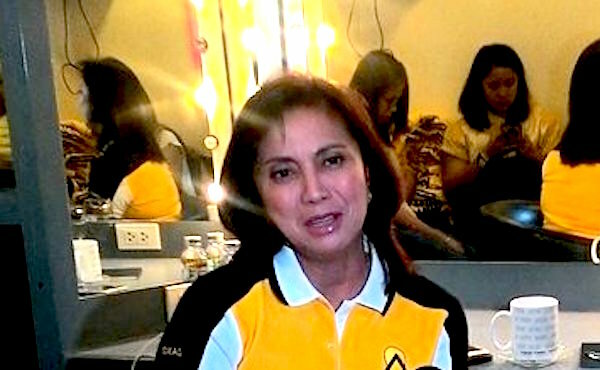 In yesterday's “#OustDuterte: Inside Leni Robredo's international propaganda maachinery”, Sass Rogando Sasot and I gave you a glimpse of how Vice-president Leni Robredo's well-oiled, well-funded, and hyper-influential PR machine works, thanks to billionaire Fil-Am lobbyist Loida Nicolas-Lewis and the Global Filipino Diaspora Council (GFDC), of which Nicolas-Lewis is part. The #LeniLeaks issue quickly gained traction as it trended on the number one spot on Twitter yesterday. Over the past year, I have established a reputation for writing well-researched articles with meticulous citations [TP: Aika Robredo]. Regardless, I still expected people to question the authenticity of sources cited, and that's perfectly reasonable. After all, the key to the credibility of my articles is not the person who wrote it, but the quality and accessibility of my sources. Active citation links allow my readers to verify the facts by their own, allowing them to become part of the investigative process, allowing them to make value judgments of their own. In the context of #LeniLeaks, it's clear that the question is whether the group indeed existed. This challenge is best encapsulated by a Facebook reaction from one of the commenters on former Interior Secretary Raffy Alunan's facebook posts. UPDATE (3:37 PM 07 January 2017): I have been notified that this comment was written by a commenter on Alunan's post, not by Alunan himself and I apologize for the error. Regardless, the essence of this article remains the same. The article has been slightly modified to reflect this development. Is this even VERIFIED or is this just being circulated as chismis? To be honest, I can type this up including the date and time stamps with just a shot of diligence and send to a newly-created yahoo group if I wanted to. The tone of composition is very fishy as well – same tone as many assumption and conspiracy theorists going around, not the tone of an insider. I think it's fair critique, considering that the GFDC yahoo group administrator set the erstwhile publicly-accessible message board to private several hours after I published my article. That is, after setting the messages to private, the citations in yesterday's article that link to pages within GFDC's yahoo groups will be rendered useless. Hence, the #LeniLeaks issue suddenly faced the possibility of dying a quick natural death. But not quite yet: those links can still be brought back to life. Suffice it to say, I try my best to keep TP hyperlinks live for as long as reasonably possible. However, the problem with the article yesterday is the fact that GFDC's administrator intentionally hid their yahoo group message board, rendering some critical links useless. However, there is a way to revive these links using a combination of two tools: Google Web Cache, and the online utility Archive.is. Google Search is useful because it allows netizens to search for virtually anything in just a few seconds. This is made possible through Google's Cache. Google has special programs called “crawlers” that scour the web for webpages, whether these pages are new, old, or modified. These crawlers take a snapshot of those pages and stores those snapshots to Google's Cache.This way, Google will just have to search its Cache whenever a netizen enters a search term, enabling Google to return results much faster than it would if it manually search the entire World Wide Web each time [GoogleGuide]. To cut the long story short, Google still has cached copies of many of the pages in GFDC's yahoo group. That is, we can look for Google's snapshots and use those snapshots as a substitute target page for the dead TP links. There are many ways to access cached pages, but I chose the most convenient, cachedview.com, which allows me to access cached copies of any given URL, if available. Cached pages, however, are temporary pages. Google regularly updates it caches every now and then. That is, a page's snapshot may be gone after some time. Thus, it's important to “freeze” a snapshot so that it can still be viewed even after Google updates or flushes it cache. To do this, I used Archive.is, a website that stores snapshots of web pages. This way, we can “freeze” the snapshot and make it accessible far longer than it would. The alternative to this 2-tool process is saving the pages on my own PC, but that may cause some sort of chain of custody issue because files saved on a PC can be tampered, roughly similar to how the Smartmatic modified the source code during the May 2016 elections [TP: BBM vs Leni]. With the Google Web Cache (CachedView) and Archive.is combo, however, we can be assured that contents of the page have not been tampered with, as the process is entirely automated. Moreover, both utilities are owned by third parties who are disinterested in the #LeniLeaks issue. I think the best way to explain the process is through an example, and let's use the one of Nicolas-Lewis' GFDC messages with URL https://beta.groups.yahoo.com/neo/groups/globalfildiaspora/conversations/messages/5904, which is basically a dead link because of access restrictions. First, go to cachedview.com, enter the desired URL, then click “Google Web Cache”. The site will then send you to the cached copy, or snapshot, of that URL. Wait for the process to finish, and you will be sent to the archived version of the cached page, and the URL of that archive will be used a subsitute for the “dead” URL. Now, we can use the Archived Copy as a substitute target page in case the original article is no longer available. And that's what I did to all the dead links in yesterday's article, since all the links leading to GFDC pages lead to a dead end. That is, all the dead links in yesterday's article are now back to life. To be honest, I can type this up including the date and time stamps with just a shot of diligence and send to a newly-created yahoo group if I wanted to. This will be true only if I have access to both Yahoo's and Google's servers, a feat that even Loida Nicolas-Lewis' camp, with all her power and wealth, cannot achieve. This part shows where the snapshot came from, i.e. from Google's cache of the GFDC post, along with date and time at which Google's crawlers took a snapshot of that page. Hence, the issue on whether Google's crawlers got it from the actual yahoo group is settled. The question now is whether this post is “planted evidence” or not. As you can see, the post has web elements that are impossible to modify without hacking skills that are good enough to fool Yahoo's own servers. The time stamp of Jan 4 6:55 AM, in particular, is not something that is easily modified. If the reader knows how to bypass Yahoo's security, I sincerely plead that she teach me how. If the GFDC Yahoo Group was indeed fabricated, how would that explain the existence of posts from , , ? 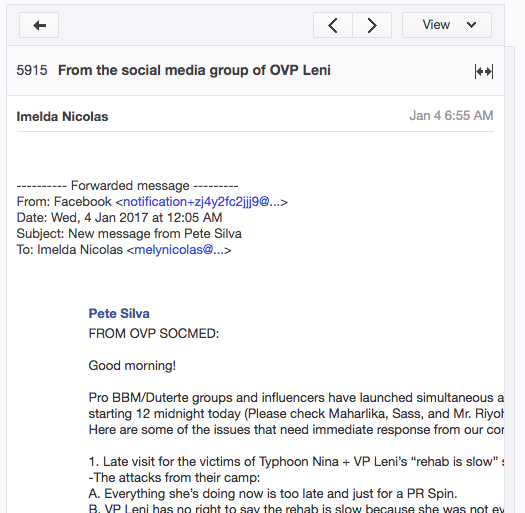 Moreover, it's interesting to note that this OVP Socmed message is corroborated by an identical message posted on Pro-Leni facebook group “Educators for Leni Robredo” about 11 hours after the 6:55 AM email [FB]. Now, dear reader, I understand your qualms about my writing style. But substance over form. Substance over form. Do not make the same mistake as that committed by the #Disente crowd. I am still giving mainstream media the benefit of the doubt on the issue of its reluctance to cover the #LeniLeaks issue, owing to the dead links yesterday. But now that the links are live again, let's see if mainstream media men will finally have the balls to standup against their elite overlords.